Many remarkable legal documents land in my inbox, and I try to mention as many as I can. Of that group, only a select few are remarkable enough to make it into the Hall(s) of Fame. I don’t think any other case has yielded both a Hall of Fame pleading and a Hall of Fame court order, but this is probably such a case. Basically, the plaintiff would like to build an operational X-Wing fighter of the kind that currently can be seen only in Star Wars. Plaintiff alleges that all the necessary technology is now available, although the complaint is a little short of details on that. His plan is to build one or more X-Wings between now and the premiere of Star Wars: Episode VIII, which would give him the ability to offer fans the chance to fly in an X-Wing replica as part of an air show he has designed for the premiere; specifically, 93,000 fans would have the chance to fly for just $10,000 each, generating $930 million in revenue. The initial development of the X-Wing would be funded by Kickstarter, however. Once X-Wing production is underway, he continued, it would quickly become the long-awaited “affordable automated personal airplane.” Plaintiff doesn’t say what the X-Wings would sell for, but he anticipates generating $15.239 billion from selling them, 45% of which he would then invest in the Disney Corporation (if it would just license the rights to him). Revenue would be enhanced by his planned launch of the campaign during a nationally televised Florida State football game. Now, you may be asking, why the X-Wing? Because it is a “symbol of hope and change.” Aren’t there other suitable symbols? 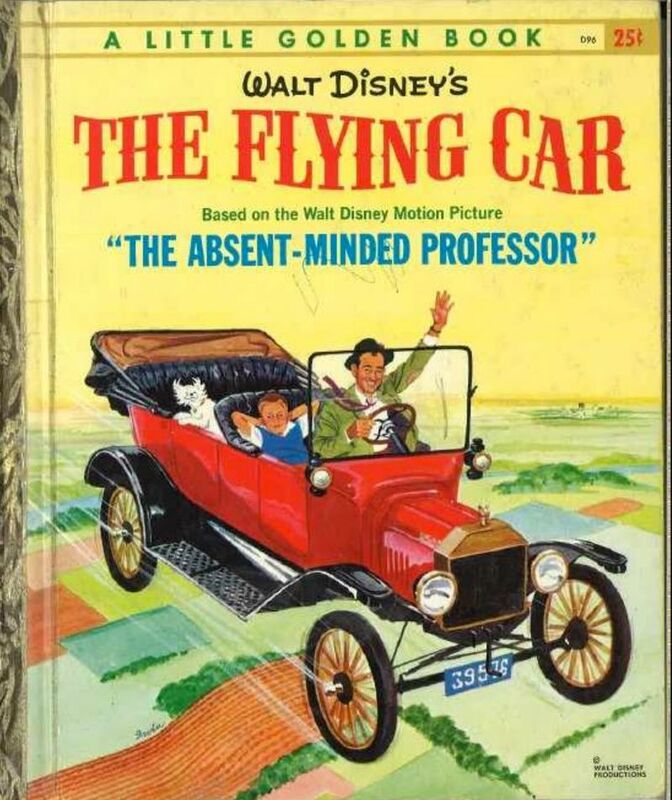 Some of which, perhaps, are not owned by Disney? No, there are not. Indeed, in all of human history, the plaintiff continues, there have only been three suitably dramatic stories from which such a symbol could be taken: the story of Noah’s Ark, J.J. Abrams’ first Star Trek film, and Star Wars IV: A New Hope. The Biblical story is the oldest, of course. “The ark is made out of cubits of wood though, so is not a symbol of hope and change.” Well, not change, at least. Star Trek also has a pretty good plot, which Plaintiff summarizes in detail. (Spoiler alert?) But there are problems. “In destroying the Romulan mining vessel the Enterprise becomes a symbol of hope and change, but it is not the best symbol we have because the Romulan mining vessel is not the ultimate symbol of evil.” Also, it is not yet feasible to build the Enterprise, sadly. What stands between humanity and this new golden age? Disney. 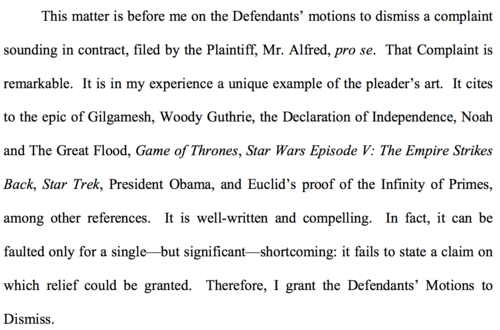 Plaintiff allegedly proposed all this to Disney in 2014, only to be rebuffed. Told that the company does not accept outside submissions, he alleged that he “offered to be hired by [Disney]” in order to solve that problem, but was told by a “nameless attorney” that the executive team was not interested. This gave rise to two causes of action, the plaintiff alleged. First, Disney breached an implied contract formed when the parties participated in a conference call. “Why even take the [call] if there were not mutual agreement[? ]” the plaintiff reasoned. Second, and similarly, certain promises were allegedly made during this call on which the plaintiff justifiably relied, giving him an action for promissory estoppel. Wherefore, Plaintiff concludes, Disney should be ordered to agree to license the X-Wing rights to him, support the building of one or more X-Wings for the premiere event, and give him two minutes of air time during a nationally televised Florida State football game. I’m not doing justice to the court’s order here, but maybe that can be forgiven due to the nature of this complaint. Even a bright light has trouble competing with the sun. But it is also excellent. In its conclusion, the court suggests that Plaintiff should persevere in his vision of better things to come: “it reportedly took Edison over a thousand attempts to create the light bulb,” for example. The court even notes that there are other flying-car symbols that might serve in lieu of the X-Wing, and provides a suggestion in Exhibit A (right). Hardly a symbol of change, though, and also owned by Disney. Well, back to the drawing board.